Amidst all of the discussion about the iPhone 3G that hits stores tomorrow, another industry changing gadget is getting overlooked. 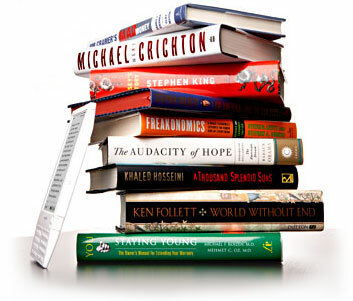 According to Time Magazine: "On a title-by-title basis, of the 130,000 titles available on Kindle and in physical form, Kindle sales now make up over 12% of sales for those titles.... At a technology trade conference in May, CEO Jeff Bezos said that Kindle sales accounted for 6% of book titles sold for the Kindle and in print. So Amazon appears to be selling more e-books." I had the chance to play with the Kindle over the July 4th weekend and am very impressed. The usability is fantastic. The product feels terrific and the readability really is natural. And considering that I traveled with five different books, the ability to store tens of books on a pencil-thin device is super attractive. My only complaints are around pricing (still restrictively expensive) and its inability to either surf the web or access blog / rss content free-of-charge. I will buy a Kindle at some point - but will likely wait until the price comes down (it's already fallen to $359) and the second version comes out... until then, I'll continue to be part of the 88% who tote around books.